Colorectal carcinoma is the second leading cause of cancer-related deaths in males and the third in females, responsible for nearly 50,000 deaths annually in the United States as stated by the American Cancer Society. Xenograft models accurately reflect molecular characteristics of human tumors aiding in the development of new cancer therapeutics. The poorly metastatic KM12 cell line was isolated from a colorectal carcinoma classified as Dukes B2, as per a 2004 study in the Journal of Pharmacology and Experimental Therapeutics. The murine models of colon cancer help researchers to evaluate management strategies for colorectal cancer. One such study in Cancer Medicine (Kita et al., 2017) used the KM-12 model for in vivo imaging of cancer-targeting drug efficacy; they found that KM-12 cells were most sensitive to entrectinib and crizotinib, tropomyosin related kinase-A (TRK-A) inhibitors. They also used this technique with in vivo xenograft brain tumor and proposed the method as a way to screen for preclinical drugs against brain metastases. A Clinical Cancer Research paper (Prewett et al., 2007) performed a combination study with oxaliplatin and cetuximab and used KM-12 cells. Cetuximab is a chimeric IgG1 antibody which targets epidermal growth factor receptor (EGFR) that was hypothesized and confirmed to overcome oxaliplatin (a third-generation platinum agent) resistance in colorectal cancer (CRC) by reducing DNA repair capacity. Results showed that combination treatment resulted in reduced expression of XRCC1 (a DNA repair component) downstream of mitogen-activated protein kinase (MAPK) and AKT pathways as well as an accumulation of platinum and DNA mutations in tumors. These results have implications for clinical translation to increase CRC combination therapy efficacy with oxaliplatin. The last example of a KM-12 utilizing study is by Ardini et al. (2014) in Molecular Oncology which used the model for its chimeric TPM3-Tropomyosin-related Kinase A (TRKA) phenotype and hypersensitivity to TRKA inhibition. Results identified NMS-P626, a potent and selective inhibitor of TRKA, and demonstrated the success of using TRKA inhibitors in the rare chromosomal translocation that is TPM3-NTRK1. The KM-12 cell line is used to create the CDX (Cell Line Derived Xenograft) KM-12 xenograft mouse model. 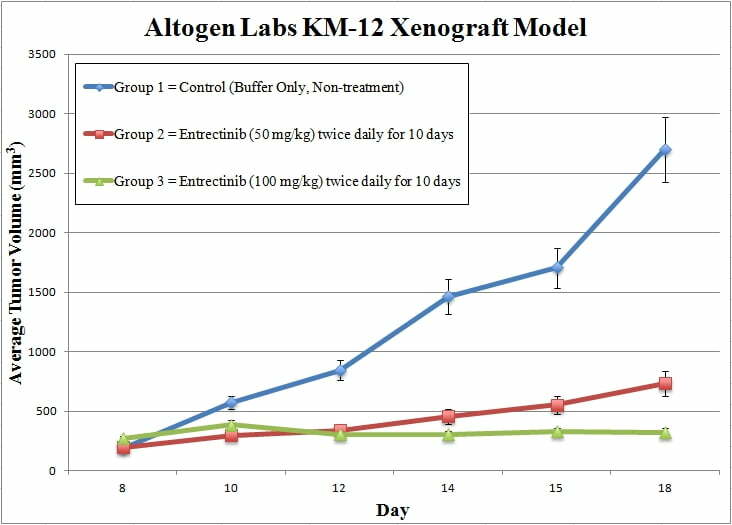 The KM-12 xenograft model enables monotherapy efficacy studies (e.g. cetuximab or oxaliplatin) and restorative combination studies due to oxaplatin resistance (i.e. irinotecan). KM-12 cells are collected during exponential growth. Viable cells are counted with trypan blue and need a minimum of 98% viability to proceed. The suspension concentration is adjusted and each mouse, athymic BALB/C or NOD/SCID and 10-12 weeks old, receives a single subcutaneous injection. The flank of the hind leg per mouse receives an injection of one million cells of the Matrigel + KM-12 cells. Injections are palpated to determine tumor establishment. The study begins at an average tumor size of 50-150 mm3, as measured by calipers (digital). Randomization of mice into treatment groups and subsequent compound administration is performed following the treatment schedule. Tumors are measured (daily) and mouse weights are recorded (up to 3 times a week). Necropsy and collections are performed as tumor size reaches the study limit. Tumors are weighed and documented. Collected tissues can be can be snap frozen in LN2 or prepared for histology.